Want to know how long Percocet remains in your body? 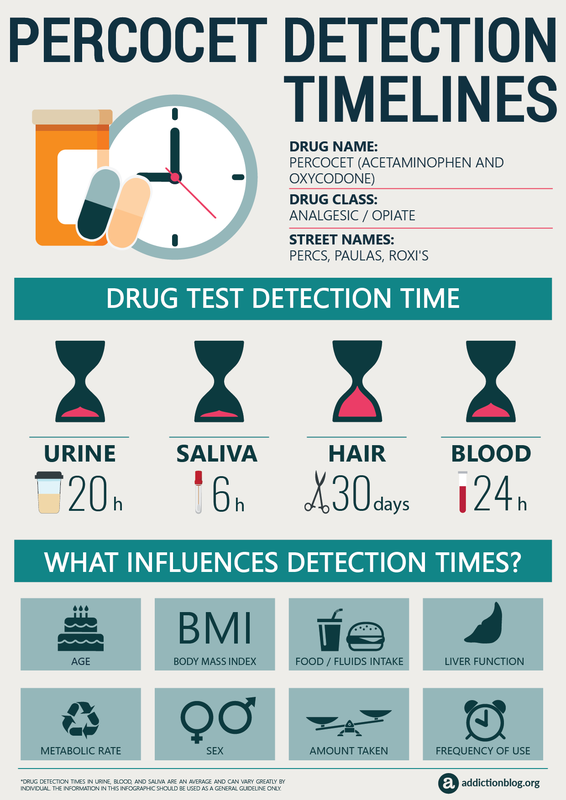 Check out this infographic to discover the exact time Percocet shows up on urine, hair, saliva and blood tests. ARTICLE SUMMARY: Percocet can be detected in a standard hair drug test for 30-90 days. It is detected in urine and blood about a day after taking it, and in saliva for up to 6 hours. What influences these detection windows? Find the answers in our infographic below, plus learn more about other factors that influence detection of Percocet. What Influences The Detection Window? Used to manage moderate to severe pain, Percocet is an opioid painkiller whose main active ingredient is oxycodone, a powerful opioid with high addiction potential. The addiction potential is so large, that according to the National Safety Council, you can develop dependence by taking your painkillers after only one or two weeks. In fact, Percocet is a Schedule II controlled substance by the DEA meaning that the substances in this schedule have a high potential for abuse. Despite the fact that Percocet can lead you to addiction, the annually prescriptions for oxycodone products have escalating numbers during the past decade. This 2013 survey conducted by the National Institute on Drug Abuse showed that in 1991 there were 76 million opiod prescriptions, while in 2013 the number reached nearly 207 million. The American Society of Addiction Medicine (ASAM) estimated out that 2 million Americans had addiction problems involving a prescription painkiller in 2016. Additionally, the Centers for Disease Control and Prevention claimed that more than 40% of all opioid overdose deaths in 2016 involved a prescription opioid medication. This means that about 46 people die ever day from opioid overdose. Urine: Usually, Percocet can be detected on a urine drug test about 24 hours from the last dose. Saliva: Tests can detect Percocet in salive up to 6 hours after your last intake. Hair: Percocet can be detected for up to 30-90 days on a hair follicle drug test, depending on the length of the sample. Blood: This medication shows up on a blood drug test up to 24 hours after your last dose. NOTE HERE: The information in this infographic should be used as general guideline only because the drug detection timelines in urine, saliva, hair, and blood can vary greatly by individual. Age. Since your metabolism is faster when you are young, your body can eliminate drugs more quickly. This means that with age, our metabolism can become slower, and the drug can stay for longer periods in the system. Metabolic Rate. The speed at which your body metabolizes food, liquids, and drugs will affect the Percocet stay in your system. If you have a slow body metabolism, Percocet may stay longer in your system. Body Mass Index. People with high percentage of body fat eliminate drugs slower. Frequency and Dosage. Detection window are longer for chronic and/or binge use. Liver function. Liver health is essential in drug elimination process. Any liver problems can slower the process of drug elimination. Hope that we have covered all important information on Percocet detection period. If you like to learn more, feel free to download our e-book The Definitive Guide To Drug Testing. Also, if you have any questions about this Percocet infographic, post them in the comments section below. We are eager to answer all legitimate questions.